Observation: That’s my job, to spread the gospel. God has given me one main job, to spread the gospel. He has given me talents and gifts to use. He tells me He is with me and the Holy Spirit will put the right words in my mouth. My job is to speak boldly when given the opportunity, act as Jesus would and make myself available to God at all times. Application: Remember how I act in front of others that I’m suppose to be representing Jesus not myself. My emotions are not important, but my job to spread the gospel is. My priority is to do the will of the Father and He does not want anyone to perish. Prayer: Dear Lord use me to spread the gospel. May I not shriek of my responsibilities but glorify you. Give me the courage and wisdom to proclaim the gospel and give me the opportunities to share with others your good news. Scripture: Mark 12:30 Love the Lord your God with all your heart and with all your soul and with all your mind and with all your strength. Observation: All means everything and that is what my God deserves, nothing less. However what I give to God is far from my all. In the morning for a few minutes driving to work, read and do my journal when I get to work, then read a little more and pray before I go to bed is far from all. My life should reflect my love for God, but I fall so short of that. If I loved God the way I should I would live a life so differently. Application: To love God the way I should He would be in my thoughts at all times. Every action and word I say should reflect that love. I should take any opportunity to share with someone about my greatest love . Prayer: Dear Lord I do love you, but not nearly enough. Change my heart and show me how to express my love for you. 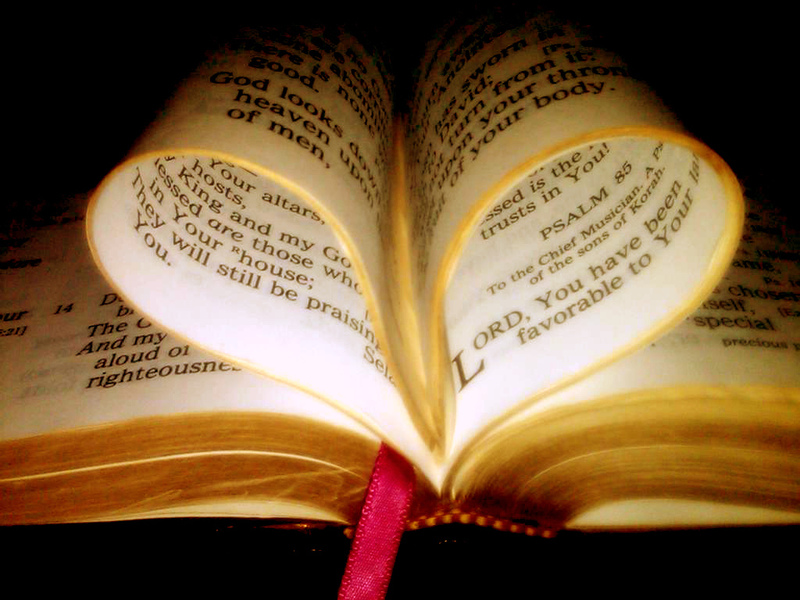 For you are worthy of all my love, praise, time and obedience. Scripture: Mark 11:22 “Have faith in God,” Jesus answered. Observation: This scripture tells me not to have faith in myself, things or others, but to have faith in God. Trusting God in all things and if things don’t go my way to pray for God’s will and trust him through the trials and tribulations. Now I’m struggling with my job, if we’ll be able to keep our home and condition of my health. These thoughts consume a good part of my time. 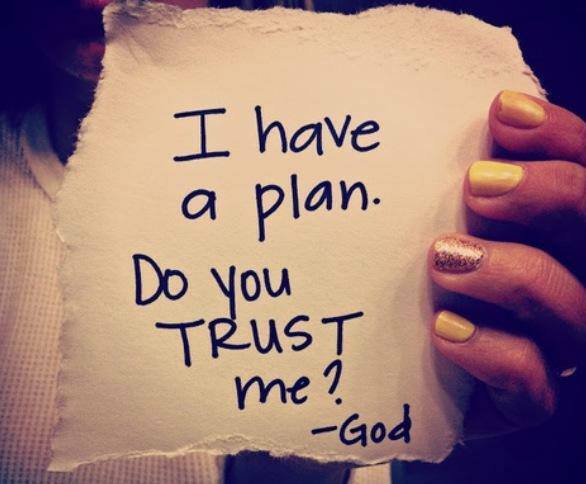 Application: I should have faith in God and trust He loves me and has everything under control. Instead of focusing on my situations and problems I should be in prayer, trusting that God will guide me. Realizing at times he will take me places I may not want to go. In everything I must have faith in God. Prayer: Dear Lord increase my faith. You are worthy of all my love, praise and obedience. Guide this servant each day and show your will for this servant’s life. 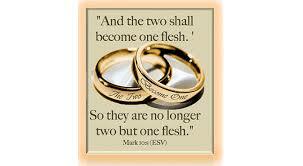 Scripture: Mark 10:8 and the two will become one flesh. So they are no longer two, but one. Observation: Married to Teri I understand this verse so much better. I feel when I’m apart from her at times something is missing and when we are together I feel complete. Just seeing her brings joy to my heart and we have so much fun together and can accomplish so much more when we do things together. Application: To be the husband God calls me to be. To love my wife as Christ loves the church. To love my wife and to make sure she feels loved, secure, happy and close to God. God has given me a purpose in my life and I will accomplish it together with my wife as I support her in her purpose. Prayer: Dear Lord I love you and thank you for my wife. I love her so much and ask how to be the best husband I can be. That I will glorify you by the husband I am for her. 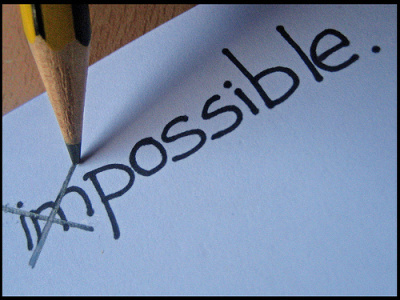 Observation: This should be the way I live my life by believing everything is possible with God. Instead, each day I worry about the little things without trusting that God has things under control. I ask God to do His will, yet I don’t believe at times and throw myself into confusion. I want to fulfill my purpose and it seems I don’t trust God to do what He wants done. Application: Trust each day for God’s guiding hand and not get so focused on tomorrow. Live for the moment because that is all that God has given me. Live a life of miracles, knowing God loves me and wants the best for me. 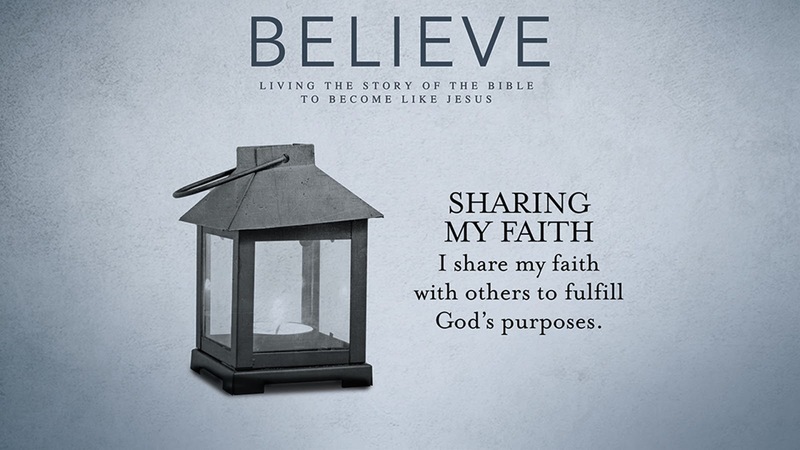 Prayer: Dear Lord I believe, help my unbelief. Open my eyes and guide me through this life in glory and honor to you. 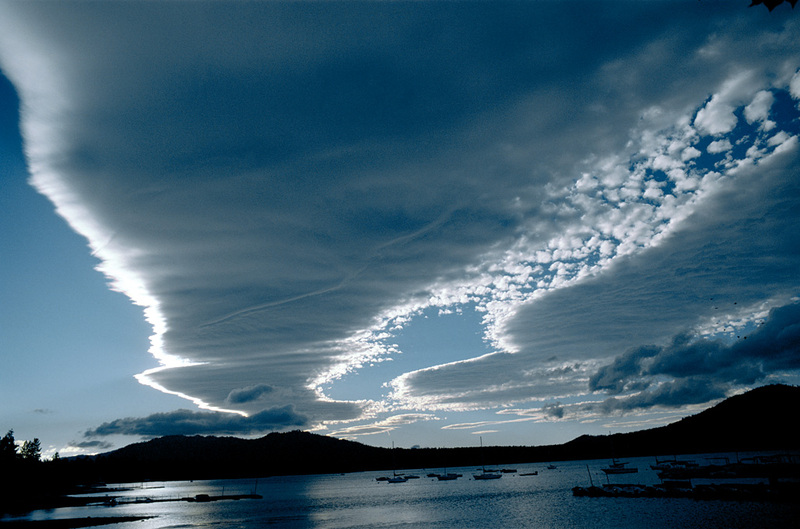 Observation: That is the way I feel, do I still not understand? God is showing me how he desires for me to live this life, but each day I do something wrong. It’s as if I can’t know his love and will for me. He speaks clearly enough, but it’s has if I can’t comprehend at times. Each day I worry, choose to relax instead of doing, I’m anxious instead of at peace. I know in my heart what should be done yet don’t do it. Application: I need to understand each day God’s direction for my life. To rid myself of any hateful or hurtful thoughts and have a heart like Jesus. Prayer: Dear Lord open my mind and show me again and again what you desire in my life. May I glorify you with the man I become. 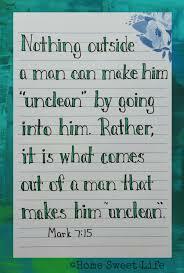 Scripture: Mark 7:15 Nothing outside a man can make him unclean by going into him. Rather, it is what comes out of a man that makes him unclean. Observation: I think of what comes out of me. Yesterday someone came up to give me some papers and I made like I was avoiding her. I do this often because something about her aggravates me. She is nice, but I don’t treat her well and my words are mean at times. That makes me unclean. When I talk about others, especially my superiors it is in a mean spirit, that makes me unclean also. Application: I need to watch what I say and guard my heart on how I feel about others. Everyone is God’s child and I have no right to say anything unless it is encouraging and out of love. Prayer: Dear Lord help me honor you with my thoughts and words. May I be looked on as an encourager and a lover of people and not a gossip. May I be clean in your sight.